Small Storage Sheds - Who Has The Best Small Storage Sheds? 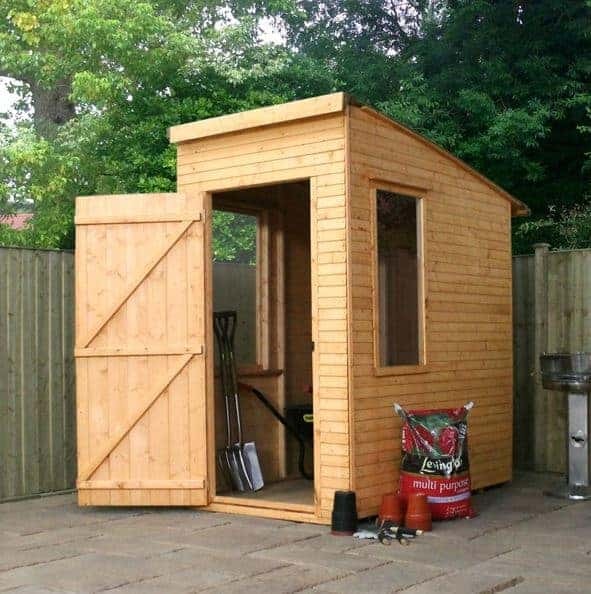 Small storage sheds can still be high on quality, and if you only have a small or medium sized garden they can also be a space saving solution that doesn’t take too much room away from the lawn itself. 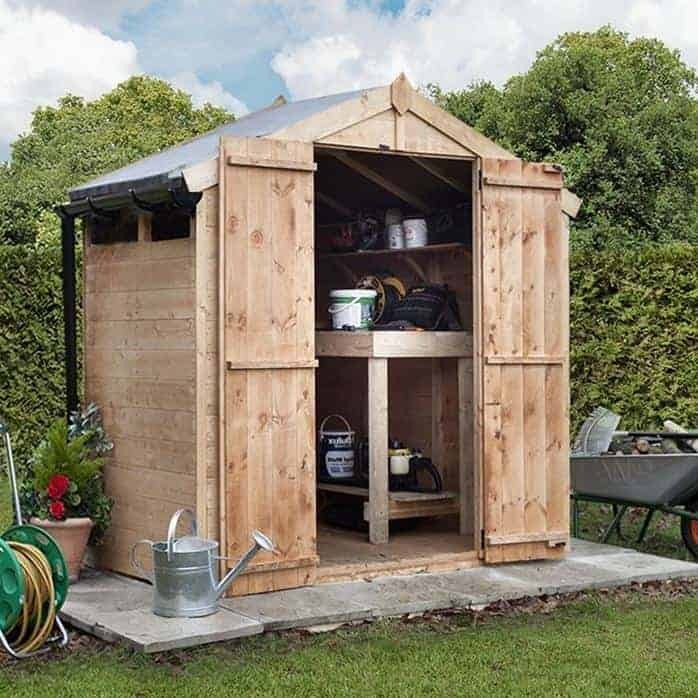 Whether you’re looking for your first garden storage shed, or supplementing a larger shed you already have, our handy guide to the best small storage sheds available to buy online in the UK right now can help you make an ideal purchase. When researching small storage sheds, we were very pleased to find ten models that deserved a place within our top table. The individual rankings were then based upon a diverse range of factors, including price and value for money, toughness and longevity, aesthetic appeal, and additional factors such as extended guarantees. Storage sheds come in all shapes and sizes, so just what defines small storage sheds? We decided upon a maximum base area of 25 square feet, as this includes six foot by four foot sheds, and yet rules out larger sheds that take up significant amounts of lawn space. When this criteria was applied, we were still happy to find ten excellent and unique examples that were worthy of a place inside our league table. Small storage sheds can be made of wood, plastic or metal, so comparing them and selecting a champion was a challenging task. Our congratulations go to the Shed-Plus six by four foot shed with log store. It offers outstanding value for money, a long warranty period, and a unique and very useful design, which is why it heads our list of the ten best small storage sheds that can be bought online in the UK right now. From storage sheds to workshops and greenhouses, WhatShed bring you in depth and unbiased reviews that can help you make an informed buying choice. The great thing about these small storage sheds is that they provide two high quality garden structures for the price of one. The main body of this six foot by four foot shed is large enough to hold a good amount of tools and equipment, and with a side window as well, it’s easy to find and retrieve items that have been stored. What we particularly liked is the canopy formed by the overhanging apex roof, as this makes an ideal log store. With increasing numbers of people turning to log burning stoves as a greener heating source, we feel this will come in very useful. It also adds value to what is already a durable and well priced shed, which is why it takes the top spot in our league table. Being made of timber it has a traditional look that we know many people like, and which we certainly found eye catching. We would have liked to see shiplap cladding used rather than overlap cladding, but this helps to create a rustic appeal, and it should still feel stable and secure once assembled. We were very pleased as well to find that the timbers have been pressure treated by the manufacturer, bringing with it a 15 year guarantee which we found very reassuring and which is as long as we’ve seen given on any of the timber clad small storage sheds we’ve reviewed. 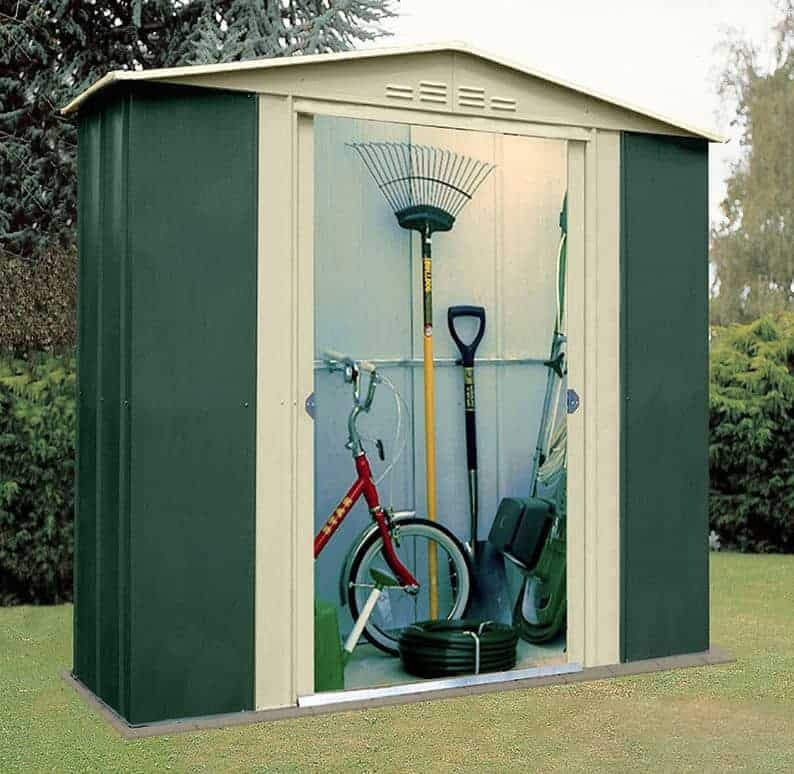 In our opinion, a base area of approximately six foot by four foot is just about ideal for small storage sheds. That’s because it provides enough room for more than simply a collection of tools to be stored inside, the wide double doors on this model making it possible to store a bicycle or lawn mower inside for example, and yet doesn’t take up too much precious lawn space. 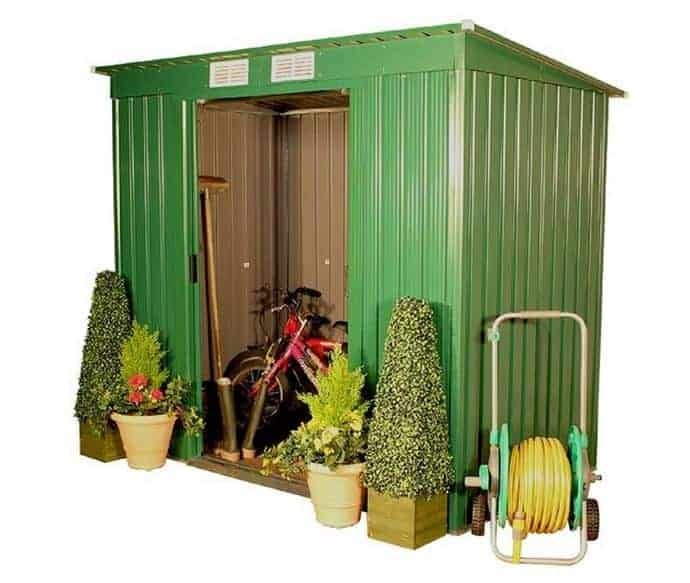 Being made of metal, this Grandale Six shed brings other advantages as well, in that it is virtually maintenance free and doesn’t need staining or preserving. 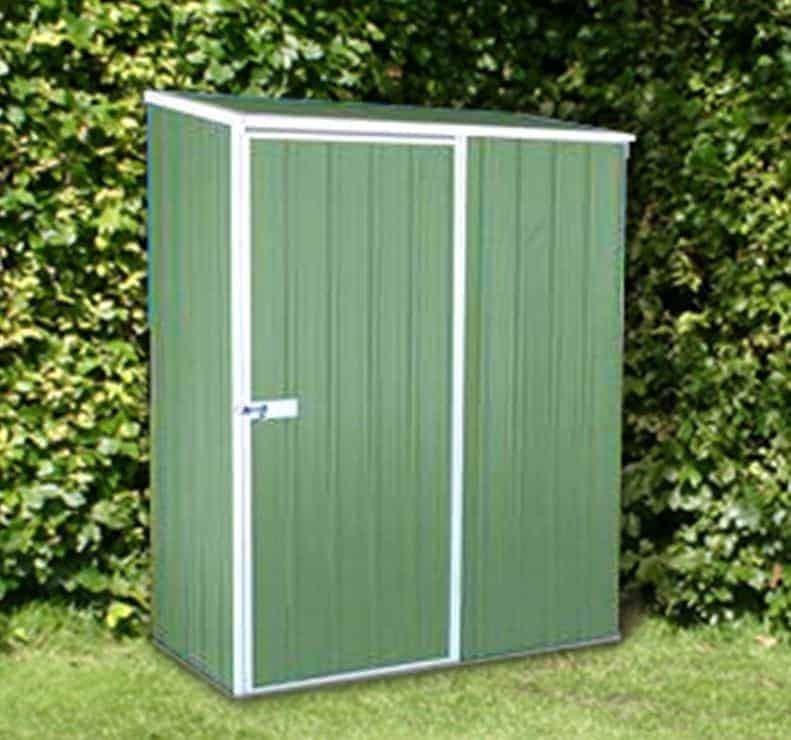 With a price tag of less than two hundred pounds this is fully deserving of the runner up position in our league table, especially as it also comes with a 20 year guarantee which is as long lasting as any that we’ve seen provided with a metal shed. We know that some people may be put off by the thought of having anything too metallic looking in their garden, but we found the green and off white colour scheme used here pleasing on the eye, and it should blend in well with a garden background. Another highly useful feature included with these small storage sheds is an entrance ramp coming from the doorway. That of course makes it much easier to use a wheel barrow to move items in and out, which is especially useful for heavy or bulky goods. The base area of 1.22 x 0.89m means that this is one of the most compact small storage sheds to earn itself a place within our top ten league table, yet that makes it even more useful for consumers who need the convenience that a storage shed brings but who only have a small garden on which to position it. 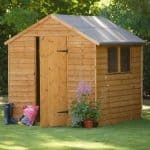 This is also among the most attractive small wooden sheds that we’ve reviewed, and that’s because the walls are made of high quality, smooth planed timbers. We wouldn’t necessarily expect to see that in a shed that costs as little as this does, and it’s this superb value for money that earns it a deserved place within our top three. The shiplap cladding locks tightly together, and so makes it very difficult for rainwater to get through. This water repellency is also aided by the apex roof, which quickly channels precipitation away. This not only helps to keep the sheds contents dry, it also helps in the fight against wet rot. We were pleased to see this recognised in the provision of a 15 year anti-rot guarantee, and this also shows how effective the manufacturer’s pressure treatment is. 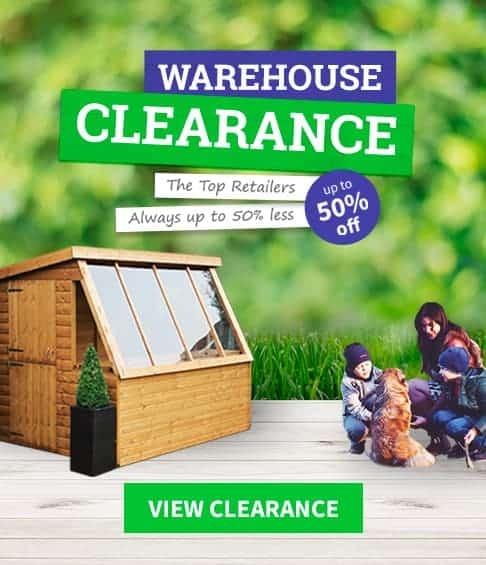 If you’re in the market for visually attractive small storage sheds that are still available for a price of under two hundred pounds, then this is one that should be near the top of your shortlist. 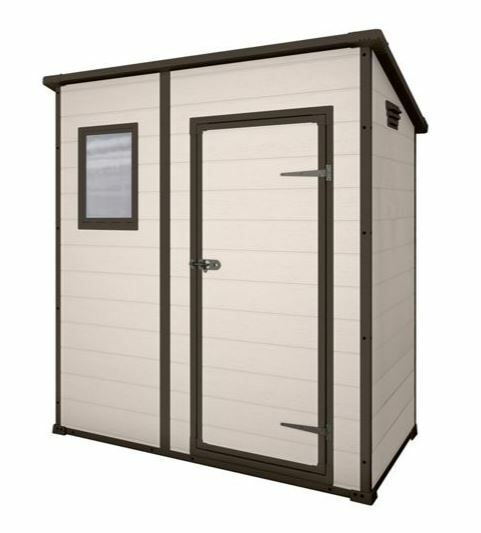 We’ve reviewed lots of medium and small storage sheds from the Australian manufacturer Absco, and whilst they may not have the sophisticated good looks of some sheds we see they more than make up for it in other areas such as toughness and durability. The first thing that caught our eye was the subtle green shade of the cladding, referred to here as pale eucalyptus; it may not be to everyone’s taste, but we feel it should fit in well with a green garden background. The next thing that stood out about these small storage sheds is just how tough they are. Once assembled they will feel very strong and sturdy, and we found the fact they’ve been tested to withstand wind speeds in excess of 90 miles per hour very reassuring. The 20 year anti-perforation guarantee supplied with the shed is a further welcome sign of just how tough and reliable they are. One unique advantage of Absco sheds found on this model is the SnapTite assembly system. 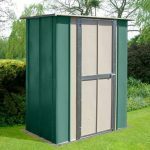 Simply put, it means the shed is very quick and easy to install, with the panels simply snapping into place along a pre-built metal frame. 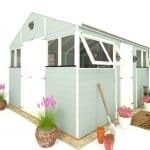 If you don’t feel confident about installing your own garden shed, or simply would prefer to spend your spare time doing something else, then we feel that these sheds offer an ideal and practical solution. Shed security is an increasingly important concern, both with small storage sheds and their larger cousins. One solution is to have a window free design, but this means that the inside can seem a little dark and unwelcoming. This six foot by four foot shed from BillyOh has an original and very effective solution, however, which we found impressive. It does feature two windows, so there’s an ample supply of light inside on a sunny day, and yet because the windows are narrow and just underneath the eaves it will be very hard for passers by to see what’s being stored inside. This makes it less likely that anyone will attempt to break into the shed, so if security is you primary concern this could be the shed for you. Another impressive feature of these small storage sheds is the wide opening double doors, making it very easy to move relatively large and bulky items in and out. We were also pleased to see that they had been braced to give them added strength, which again can be an important boost to the security of the shed as a whole. One downside to this otherwise excellent shed is that it comes without a floor, so you’ll need to add one as an optional extra. Even with this slight additional expense, we still feel that they represent good value for money and therefore deserve to be in the top half of our league table. 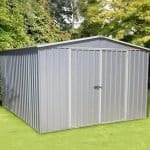 We’ve reviewed lots of BillyOh Sheds, in all sizes and made of all substrates, so we were pleased to find that their galvanised steel small storage sheds demonstrated the quality and value we’ve come to expect of the range as a whole. This is the first metal shed in our league table to utilise a pent roof, but that makes it less obtrusive than an apex shed and also means that it may be possible to hide it away behind a fence or wall. This can be a useful aide to security. We were also pleased to see that the handles on the double sliding doors were holed and ready to accept a padlock, even though a padlock itself isn’t included. 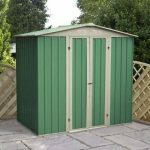 We’ve reviewed lots of green coloured metal sheds, but we particularly liked the vibrant shade of green employed on these small storage sheds. Once again we were pleased to find that this shed comes complete with an entrance and exit ramp, and as the galvanised steel cladding is fire resistant we feel it would make a perfect store for a petrol lawnmower, alongside other pieces of gardening equipment. 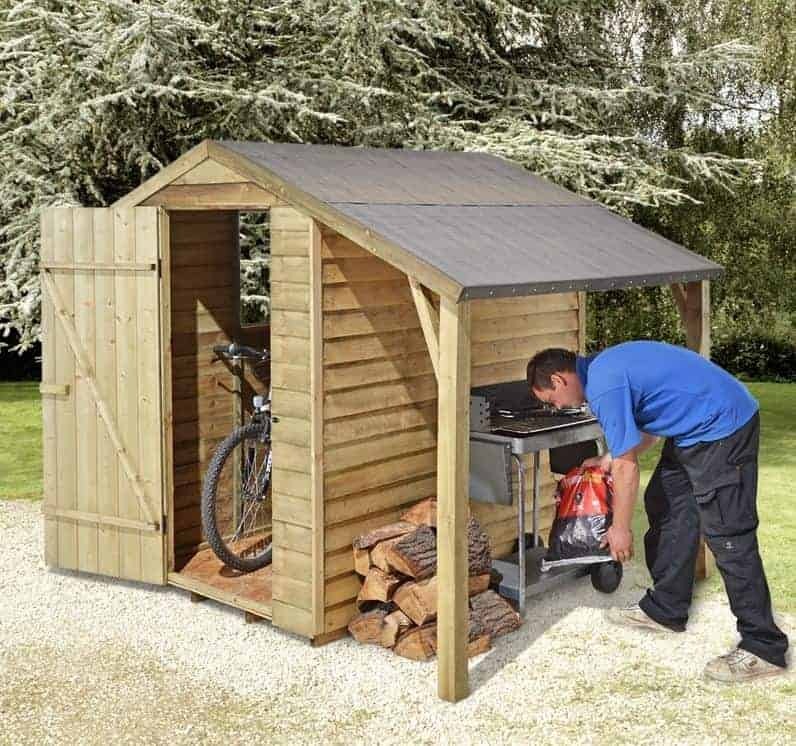 We were also impressed by a price tag of significantly less than two hundred pounds, especially as the shed also comes with the reassurance of a 15 year guarantee. If you think that all plastic clad sheds look the same, or that they have to be dull and uninspiring, then these small storage sheds could be the ones to change your mind. 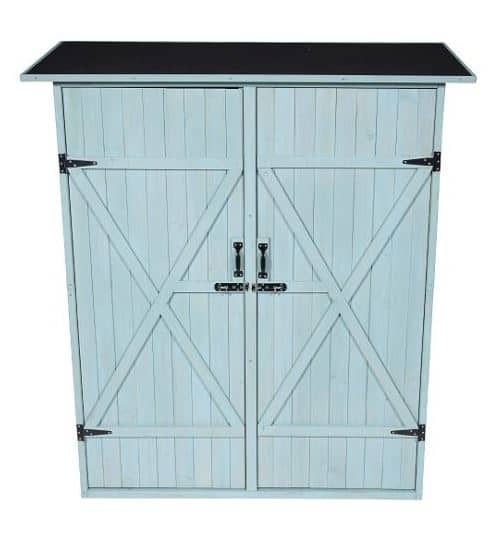 Keter sheds are known for their original and striking looks, and we were pleased to find that this six foot by four foot model is no exception. We were struck on first sight by the white plastic cladding with its black contrasting stripes around the single hinged door, window and roof. It’s a very contemporary look, and one that will fit in well with gardens that already have lots of white PVC features such as a conservatory or windows. This is also the first of our top ten small storage sheds to have a pent roof rather than an apex roof, although with a peak height of 2.01m most people won’t have to stoop down too much when inside. This makes it a good choice for gardens that have a lot of overhanging branches or foliage. We were also impressed with just how tough this shed is considering its compact size, and with high quality polypropylene used for the walls and shatter resistant styrene utilised for the window, we feel it should last far longer than the 10 year warranty period suggests. 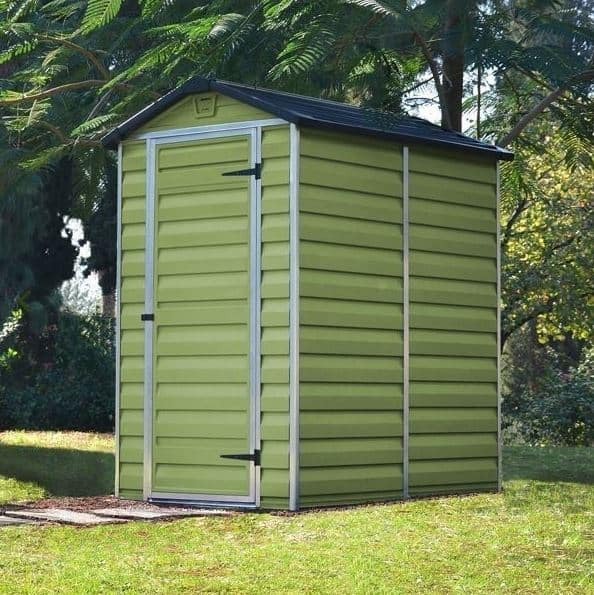 Palram’s small storage sheds can also be purchased in a grey or amber brown colour, but we prefer this olive green colour scheme as it blends in very nicely with a typical garden environment. There are no external windows on these sheds, which we welcome as a positive because it means that passers by with prying eyes will be unable to determine whether anything of value is being kept inside. It does however have a tough polycarbonate apex roof that acts as a skylight and means that the interior is bathed in light when the sun is out. It was also good to find that these polycarbonate panels are UV resistant, protecting both goods and people inside. Another feature that we particularly liked on these plastic clad small storage sheds is the easy grip floor. That means that even on wet days, or when you walk in from a muddy garden, you won’t have to worry about slipping. It’s a neat and very useful feature, and this would have been placed further up our top ten league table if it wasn’t for its higher than average price tag. 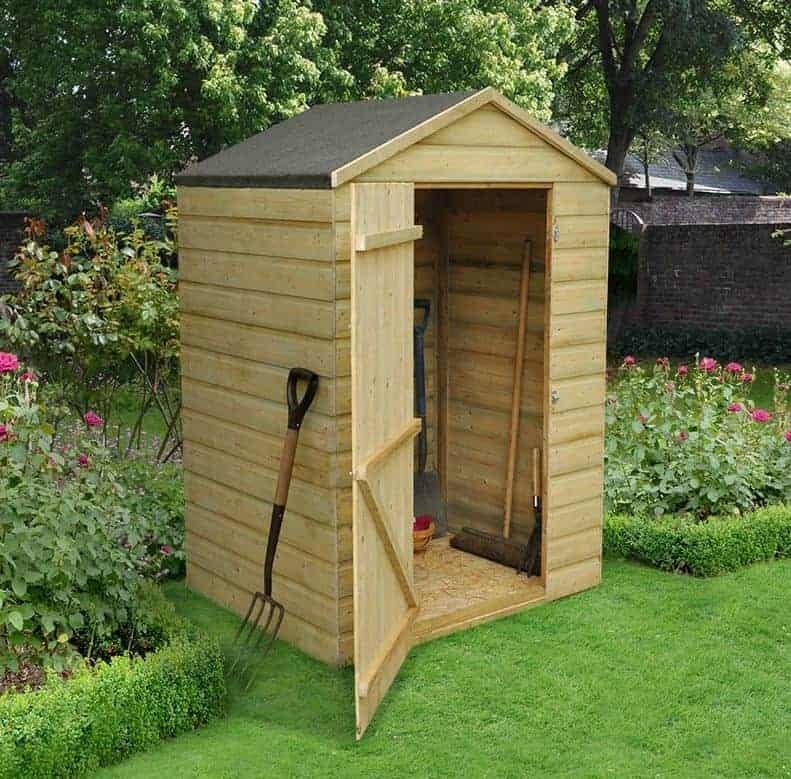 Even so, this is a shed that has a lot to recommend it, with the 10 year manufacturer’s warranty being just one of its positive features. Just because small storage sheds share relatively compact dimensions doesn’t mean that they have to share a similar appearance too, as this original shed shows. The unique visual feature is a curved roof and the accompaniment of two long windows on the side panels. The effect is a shed that looks striking and strikingly different, so if you’re looking for a storage facility that’s big on style and that really makes a statement this could be the shed for you. Another thing we really liked about these small storage sheds is that they are sold in conjunction with the Woodland Trust, the leading charity that’s committed to preserving the UK’s woodlands. The charity gets 5% from each purchase made, so this is ideal for people who are concerned about environmental issues and their carbon footprint. It’s also worth noting that we were very impressed with the shiplap cladding, which at 16mm is much thicker and stronger than we see on most small scale wooden sheds. For further reassurance it comes with a 10 year manufacturer’s guarantee against rot. Whilst we were highly pleased with this shed’s looks, and welcome its innovative features, they do come at a higher than average asking price, and this is reflected in the position within our league table. Maintaining a classic wooden small storage shed can take a lot of work, including painting or staining it on a regular basis. That’s one reason why we liked this storage shed so much, and why it stood out from the crowd despite having a basic design and a pent style roof. What really differentiated this wooden storage shed is that it comes pre-painted in what we found to be a highly attractive sage colour. That not only saves the owner time in painting it themselves, it also means that the wood is protected from the sun’s UV rays that can otherwise crack unfinished timber or transform it to a silver colour. Another unique feature we really liked about these small storage sheds is that they come with two integral shelves, which again can save time and money. It’s one of the shallowest sheds we’ve seen, with a depth of just 0.55m, but the width of 1.40m and height of 1.62m means you can fit more inside than you might think, especially as the full width double doors allow easy access to every corner of the interior. Whilst the 3 year warranty provided by the manufacturer is less than on the other sheds in this league table, it should be noted that it’s still higher than on many sheds that we review.